Silverstone is playing hard to get. The venerable racing circuit signalled its withdrawal from the Formula One season from 2020, citing escalating costs. It is a fascinating moment for the sport. So much of F1’s appeal is wrapped up in the sentimentality of history, but its push for a modern, glittering future risks leaving that behind. So will F1’s new owners, Liberty Media, take the bait and seek to help? The only legitimate way for everyone to save face in this scenario would be for Liberty to buy Silverstone itself and shut down any accusations that they are letting the circuit back in the game on the cheap. Or might there be a new role here, perhaps, for a certain billionaire with a shock of white hair who only recently relinquished his grip on the world’s premier motor racing competition? The Silverstone circuit is enshrined in motor sport history. It hosted the first ever World Championship Formula One race in 1950. But now its owner, the British Racing Drivers Club (BRDC) has reached a financial tipping point. It feels unable to sustain continued losses from hosting the British Grand Prix, which were £2.8m in 2015 and £4.8m in 2016. It has therefore exercised a break clause in its contract with F1/Liberty Media. There has been talk about the race relocating elsewhere, but there is no other facility that could host the 350,000 spectators that annually visit the former airfield in Northamptonshire, northern England. A mystery street circuit in London was suggested as an alternative by Liberty’s F1 CEO Chase Carey but no details have been aired in public. In any case it seems unlikely that the Mayor of London, Sadiq Khan, who is working with the C40 Cities organisation to identify real-world car emissions and their impact on air quality, would find that this fits with his agenda. Politicians are sensitive to their electorate. Wherever such a circuit might be in London the local residents almost certainly would follow the lead of the “Save Battersea Park” campaigners who saw off the much more politically acceptable electric motor racing series Formula E after just two seasons. 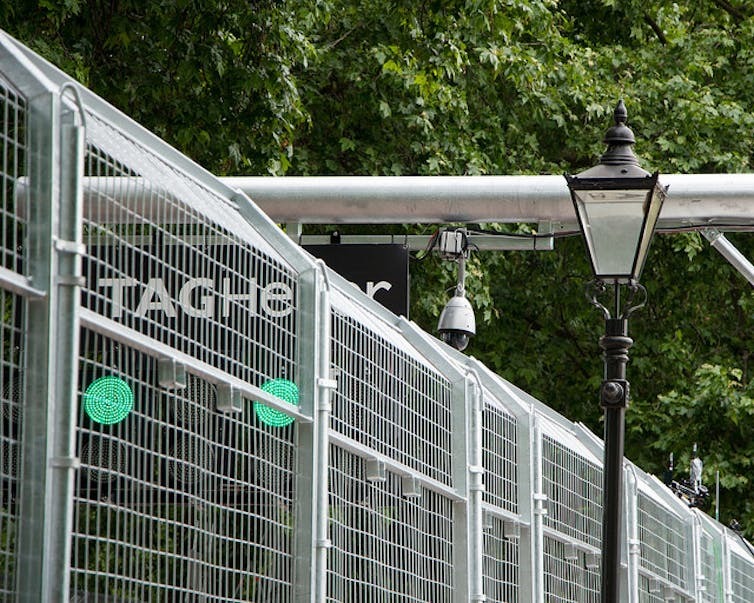 No more green lights for Formula E in Battersea Park. Well-known motor racing circuits such as Brands Hatch and Donington cannot cope physically with the demands of modern grand prix racing and the huge crowds involved – Brands Hatch’s record crowd is only a little more than 100,000. Silverstone itself seems the only realistic solution for the British Grand Prix. If no deal is done the worst case scenario would be that the this iconic event, which was first run at Brooklands in 1926, could be lost. Silverstone could be sold or leased to the right bidder. Jaguar Land Rover, which was recently keen on just such a purchase, failed to pull it off. One of their aims had been to establish a company heritage centre at the track. The BRDC has plans for its own heritage experience to open there in 2019 as well as for a hotel complex. So, what sort of organisation might take on such an asset? Is it too far fetched to think that F1’s new owners might fit the bill perfectly? Liberty Media is well versed in the entertainment business and you only have to look at another of its sporting assets, Suntrust Park, the home of the Atlanta Braves baseball team to see the company’s existing experience in establishing a major entertainment complex. Liberty is hoping to emphasise F1’s potential as an entertainment spectacle, and to bring in more and younger fans from around the world, but it still has a keen eye on the decades of glamour and stories which have defined the sport’s appeal. The company has stated its wish for the British Grand Prix to continue as one of motor sport’s historic blue-riband events, and has already offered to run the race for the BRDC. But what about buying the whole entertainment complex and developing it? Zak Brown, executive director of the McLaren Technology Group, thinks they should. The added bonus is that this would sidestep any accusations of favouritism from other race promoters if, in an alternative scenario, the BRDC were granted a reduced fee for the race. The final twist could be that Bernie Ecclestone, who is just getting used to semi-retirement from a lifetime of running F1, is not without influence, knowledge and funds. Could he come up on the rails and buy Silverstone and could the BRDC work with him? He admits to having made just such an offer in the past, but denies he is interested right now. Is this a classic piece of posturing? At the British grand prix this weekend, the action will be focused on a historic circuit as iconic names such as Ferrari, Mercedes and Williams fight it out. The huge crowds both at Silverstone and watching on global television will find it hard to believe that the race might be lost after 2019. Think that’s impossible? Well things do change in this sport. The French Grand Prix reappears on the F1 calendar again next year after an absence of ten years.